Growing up my mother never really made stews or chili. I'm not sure if she didn't like them or never learned to cook them, but any of the chili or stew we had came from a can or was eaten at a restaurant. I taught myself to cook from cookbooks as a young teenagers and used my parents as guinea pigs for my food experiments It was during these experimenting that I fell in love with making chili and stew. I mostly made vegetarian stews and chili since I was a vegetarian for most of my teens years. However, in my twenties I went back to eating meat and married my husband, a huge meat fan. In the last 10 years I have been making meat stews and chili from scratch more frequently and was interested when a recent issue of Saveur magazine had a recipe for Carne Adobada (Red Chili and Pork Stew), which looked delicious and different from the usual beef and pork dishes I am used to making. This recipe has 13 ingredients, including the tortillas for serving. I had to make some major modifications due to availability of ingredients in my area. I was unable to find either New Mexico chile powder or dried New Mexico chiles, so I substituted with locally attainable ingredients. 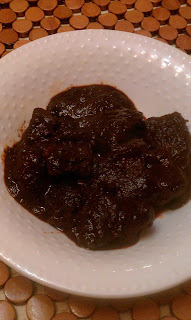 For the chile powder, I substitute Ancho chile powder and for the dried New Mexico chiles I used dried Ancho chiles. Since I was using a different type of chili, I seeded and stemmed them before toasting. I find dried Ancho chiles to be too tough and they don't fully liquefy in the blender when the seeds are left in, therefore I prefer seeding them for recipes. When salting the stew make sure to taste the pork with the sauce, or you will be tempted to add to much salt. The sauce is somewhat bitter on it's own, but the flavors blend perfectly when paired with the pork. I did find that I had to add slightly more honey than the recipe suggested maybe another tablespoon and the other 1/2 of the lime, in order to reduce the bitterness from the ancho chiles. I followed the remainder of the recipe as written. I was pleased with the results of this stew. The sauce had a delicious, slightly chocolate undertone and the pork was tender and perfect. My two-year-old loved the pork in this dish and picked it out and ate his whole serving. My husband liked that it was something different than out usual pork routine and appreciated the multitude of flavors. This is a delicious stew recipe and worked well even with my ingredient modifications. For the recipe go to Saveur Carne Adobada (Red Chile and Pork Stew). This dish is probably a popular one out here in the southwest, even thought I've never had it myself. It looks delicious! @Andrea I love using friends and family as guinea pigs :) Thanks!